Florida 2000 was being investigated when 9/11 happened and we never really went back and settled how it happened. (There is a great book on the subject if you're interested, by Rick Hasen. )There was ample evidence however, that they stole it. The new deadline for all recounts to be submitted to Katherine Harris was 5 p.m. Sunday, November 26. Now, that Sunday afternoon you could watch any of the television coverage and see that Palm Beach was still counting. And by late afternoon you heard various officials in Palm Beach acknowledging that they were not going to be finished by five. Now, we maintain that was completely illegal, because the law said you had to manually recount all ballots. 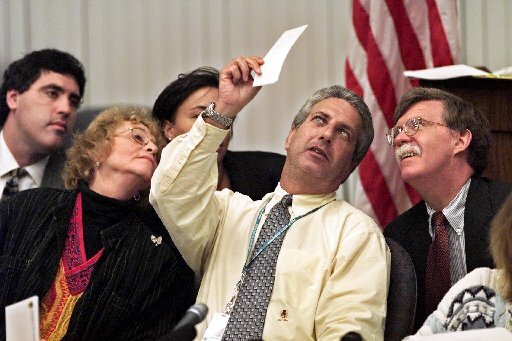 But as five o'clock approached, we heard that the secretary of state was going to accept the Palm Beach partial recount --- even though the Palm Beach partial recount was blatantly illegal. We were told that the secretary of state's view was that unless Palm Beach actually informed her --- in writing or otherwise --- that the returns were only a partial recount, she could not infer that on her own. So we made some calls to a few Republicans overseeing the Palm Beach recount. We told them to gently suggest to the canvassing board that it might as well put PARTIAL RETURN on the front of the returns that were to be faxed up in time for the deadline. The reason we gave was clarity --- that the words PARTIAL RETURN would distinguish those returns from the full count that would be coming in later that night. I'm not exactly sure what happened, but I think the Palm Beach board did in the end write PARTIAL RECOUNT on the returns. We all know that the Secretary of State, in the end, rejected them. I think the board members probably agreed to write the PARTIAL RECOUNT notation for two reasons. First of all, I think they hadn't slept in 48 hours, so I think they'd sort of do anything. Second of all, I don't think they or anybody else would have suspected that it would actually make any difference. Who would imagine that without the simple notation of PARTIAL RETURN the partial count would have been accepted as a complete count by the secretary of state? Even while the television showed them still counting? The GOP hack running the election recount made up an arbitrary ruling trap which the GOP hacks stealing the election then manipulated the sleep deprived election officials into unknowingly falling into. This is just one example of the kind of thing they did every step of the way. It's what they do. By the way, that picture up top is, of course, John Bolton. He's the guy who famously ran into the room after the majority of the Supreme Court ruled for their party and yelled "Stop the Count!" The Republicans should make that their new slogan.